Willie: I was living the life of a successful groundskeeper, sleeping in a shack and eating rock-hard tater tots. But so was Wilma, my colleague and rival. Skinner: Willie and Wilma, I’m afraid the school needs to make even more cuts than usual, and we can only keep one of you. To decide, we’re going to do it the same way we chose which librarian to keep: a brutal, winner-take-all physical contest. Collect Love Fertilizer- x100. 4hrs. Willie: Ah, I’ll just start heading to the first-place podium now. Groundskeeper Wilma: To pave the way for me, eh? We’ve got a long way to go to determine a winner. Willie: Actually, I just took the lead — pacing was the first event! Willie: Aye, we’re an even match, Wilma. I’m starting to think we’ll never settle this. If we keep staying tied, we might as well tie the knot! Groundskeeper Wilma: We’ll see about that. If anyone’s marrying anyone, I’ll be marrying you! Willie: Arrgh, even the talks of wedding bells got our competitive blood boiling. Collect Love Fertilizer- x300. 4hrs. Skinner: Before we start the Kindergartener-vomit-clean-up Speed Round…I want to say that this is one of the most erotically-charged janitor contests I’ve ever judged. Willie: Forget it! I’ll tell ye after we finish cleaning up this barf! Willie: The way you poured sawdust on that throw-up was quite lovely. Groundskeeper Wilma: That’s the sweetest thing anyone has ever said to me. Skinner: The Groundskeeper-off is deadlocked at 68-68. The final contest is a race up the roof to clean all the gutters. Ready, Set, Go! Groundskeeper Wilma: Say Willie, how about a date at the top of the roof? Willie: First one to finish cleaning the gutters can ask the second one to the date. It’s only fair. Skinner: I can’t believe this, but it’s another tie! The contest must continue! Willie: A tie?! That’s a curse on both our families. Groundskeeper Wilma: We’ve had enough competitions. Let’s settle this once and for all! We each take this poison, whoever dies first will win it all! Bart: You guys are weird, I’m gonna go tag some bluffs. Skinner: Wait! Wait! Don’t drink the poison. The winner of this competition is… no one. Willie: So we’re both fired? Skinner: Neither of you are. There never was a contest, I just wanted you guys to do a bunch of work around the school really quickly. Groundskeeper Wilma: No winner?! I can’t live like this. I’ve got to go be the best at another school. Willie: Farewell, Wilma. I’ve never met a tougher or more beautiful competitor. And this concludes the full dialogue for week 2 of the Love, Springfieldian Style Event! What are your thoughts on Willie’ story? Did you enjoy it? Did you miss out on the dialogue the first time around? Are you like Snake and didn’t understand one bit of it? Sound off below, you know we love hearing from you! 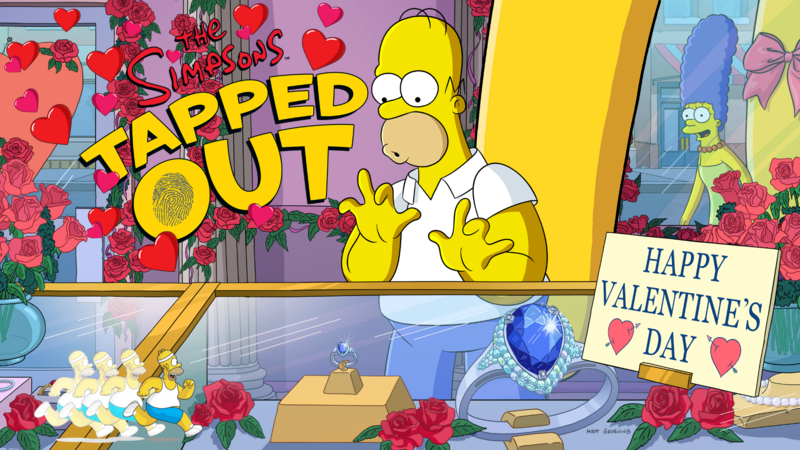 This entry was posted in Game News, Tips and Tricks, Updates and tagged full dialogue for Rome-Eh & Julie-Aye, how do i get groundskeeper wilma, How do I get more land tokens, How do i get shelbyville items, Love Springfieldian Style Event, Rome-Eh & Julie-Aye questline, Tapped Out Tips and Tricks, The Simpsons Tapped Out, TSTO Addicts, TSTO Tips and Tricks, TSTO Valentine's Day 2019, Willie's Valentine Story diagloue. Bookmark the permalink. You know you are an addict and have been playing this game way too long when you’re watching an episode of The Simpsons on TV and you see Chief Wiggum in his police uniform and you quickly wonder why he’s not in his Stonecutter outfit earning at a premium rate! Maybe I shouldn’t play Tapped Out and watch The Simpsons at the same time. I did the same thing on Sunday in regards to unlocking Wilma, then I went “d’oh, scroll up!”, but in my defence, I did just wake up. Can’t wait for more. I love my Simpsons game. I finish all of act 2 and act 3 has yet to start. Is this correct. Anyone know when it starts ?